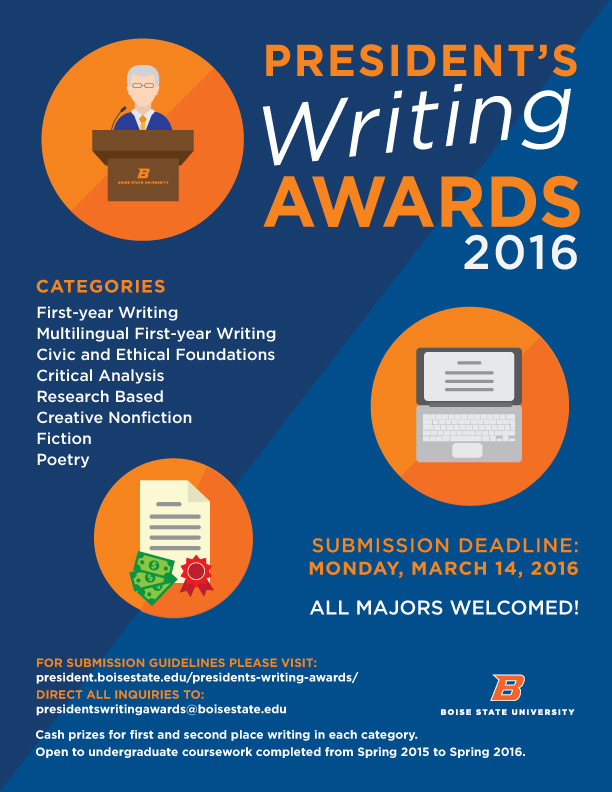 Currently in its 37th year, the President’s Writing Awards contest honors undergraduate writing at Boise State. If you submitted, please watch your email. We intend to reply to winners from April 10-12. 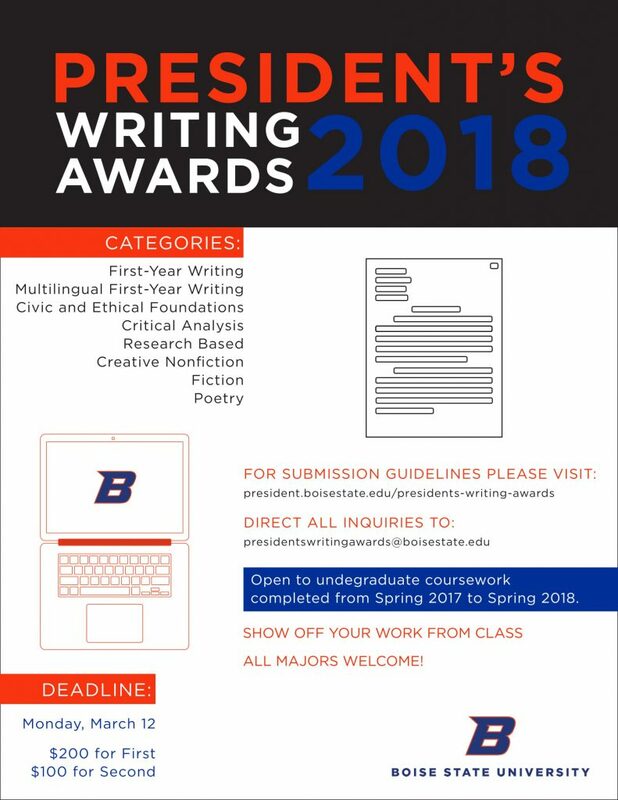 We will not be replying to those who did not win, but a list of winners will be announced on Twitter, Facebook, and the President’s Writing Awards website. 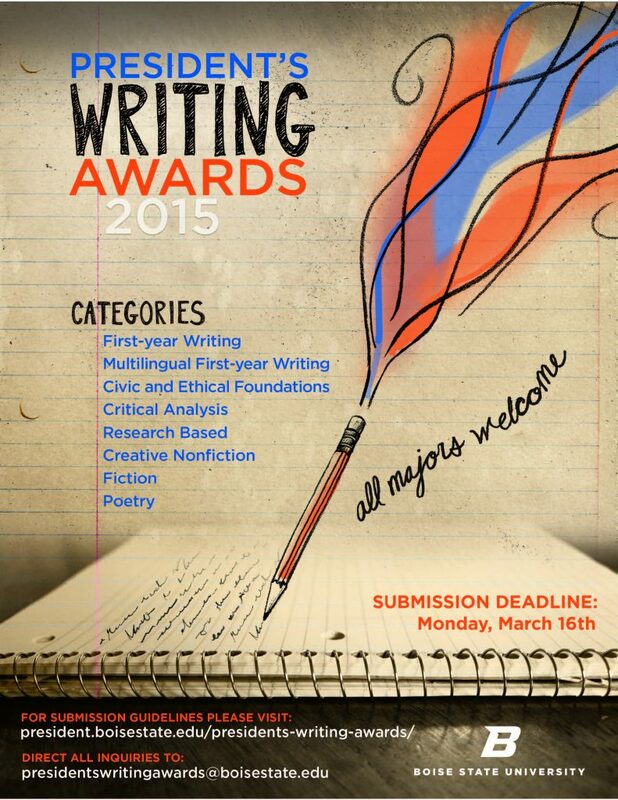 Thanks for your interest in the President’s Writing Awards! 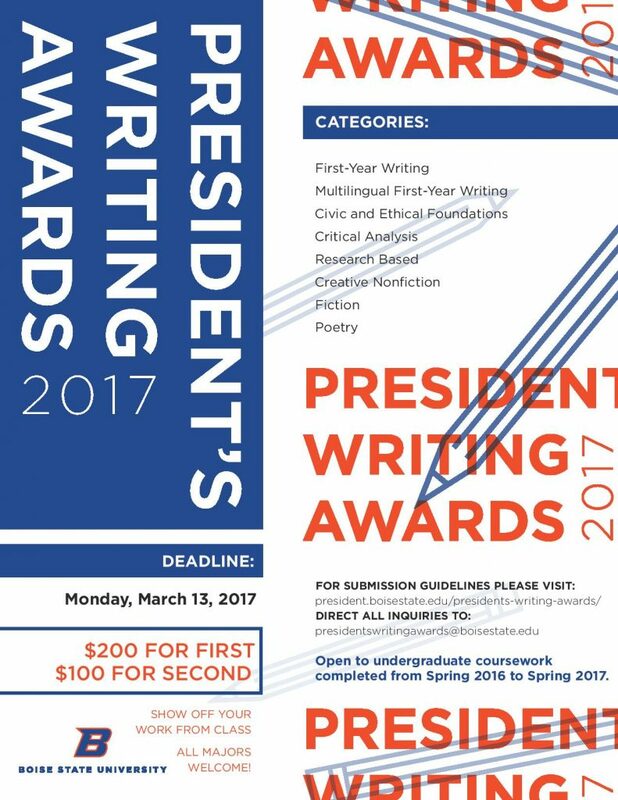 Winners of the 36th annual President’s Writing Awards. 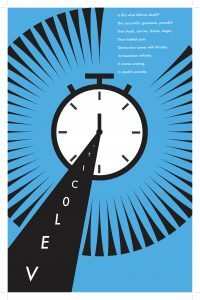 Graphic Designers — Each year the President’s Writing Awards works with a graphic design student to create posters, fliers, and banners to market the award. Manuel Baeza has been living in Boise and Meridian, Idaho, since the age of 5. Since a young age Manuel has had a deep passion for drawing and creating things out of random materials (building a building out of wire, cardboard, wires and hot glue). Growing up, Baeza believed that he would be an architect, but halfway through his high school years, he discovered graphic design and fell in love with it. Unknowingly, the countless doodles that he used to make when he was a kid grew alongside him, to the point in which those doodles on paper graduated to become doodles on the computer. Baeza is currently in his junior year at Boise State and is getting ready to apply to the graphic design program. In the future, he plans to take his graphic design to the world stage to use it as a way to bring people together and work for some of the world’s biggest companies. Brooke Cassity grew up in Ontario, Oregon, a small town located an hour away from Boise, Idaho. Before going to Boise State, she received her Associate’s Degree at Treasure Valley Community College in Ontario. From there, she discovered graphic design was her thing. 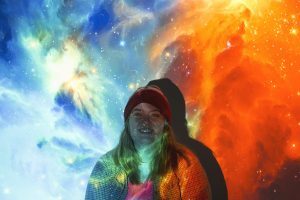 She is currently in her final year of the graphic design program at Boise State. After graduation, she hopes to expand her own business and find a job in the Boise area. Glenna Gomez was a pre-school doodler. She doodled at the table, on the floor, in the church pew. What does she do outside of school and work? She doodles. Only the doodles have evolved into sophisticated designs and abstract paintings in acrylic and watercolor. In 2012, Glenna graduated with an associate’s degree in graphic design in print media from Idaho State University. While there, she interned for the Idaho State Journal creating everything from advertisements to logos. The experience prepared her for the next step—Boise State University. Glenna is majoring in graphic design and works for Student Affairs Marketing designing poster, flyers, brochures and other promotional materials for student events. She said the position “allows me to expand my skills and knowledge. Even though I have gained three years of experience, I feel like I’ve barely skimmed the surface. Glenna is from Blackfoot, Idaho. She is also majoring in Spanish with an emphasis in business and plans to graduate spring 2016. Her vision is to open a studio in Boise and help the Hispanic business community by creating effective designs. Originally from California, Lauryn moved to Idaho to complete her first degree in Fine Art at the College of Idaho and fell in love with Boise’s music and art scene. She is now enrolled at Boise State University as a second-degree Graphic Design and Illustration student. She also works as the student Graphic Designer for the Bronco shop and Bookstore on campus. When she’s not at the Boise State Campus, you can find her working at Angela R. Stewart Design, Inc. A.K.A. 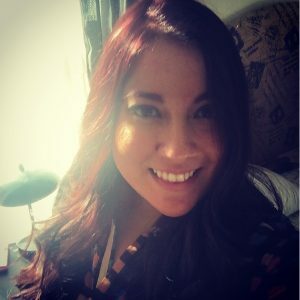 Ladybug Press, where she gets to illustrate and design greeting cards, coasters and other various projects. Freelancing jobs help her learn as well as stay current with her skills. 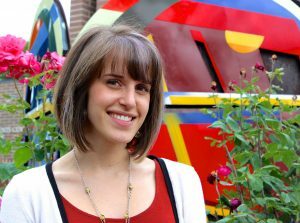 Lauryn works on illustration and design for various small companies, clients, and friends. Our page of previous winners is being updated but will be available soon!